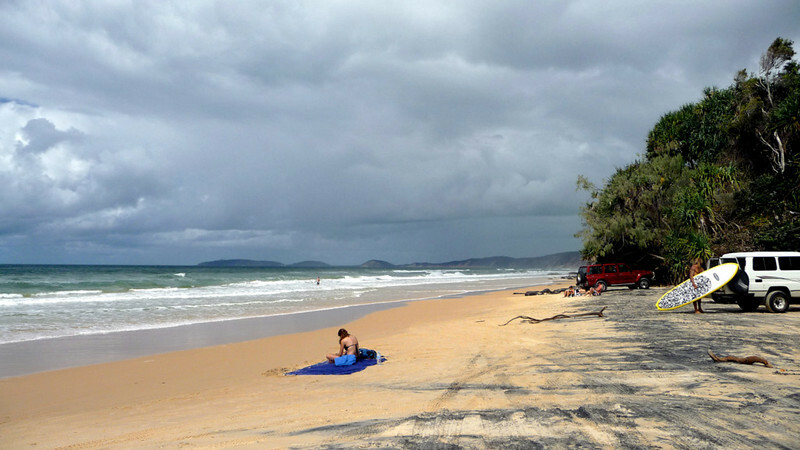 I had no sorrow or difficulty leaving the Gold Coast tourist trap in southeast Queensland* – under the lurking shadow of ever threatening clouds .. this April Fools' Day. Thunderstorms were predicted for the following couple of days by the forecasters at BOM (Bureau of Meteorology) .. so nothing new then on the weather front for me in this particular region of The Lucky Country! 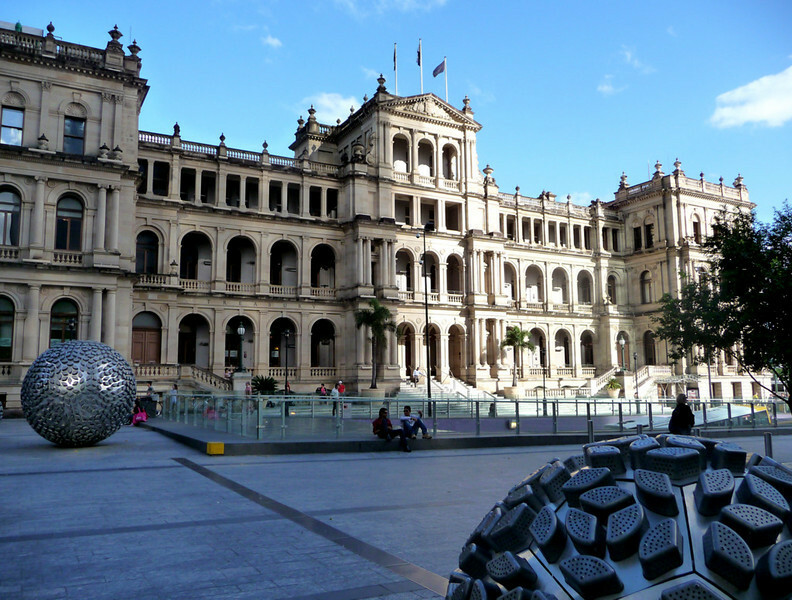 * The State of Queensland now completes the set. I/we have visited and spent time in every state and territory of the Australian continent. 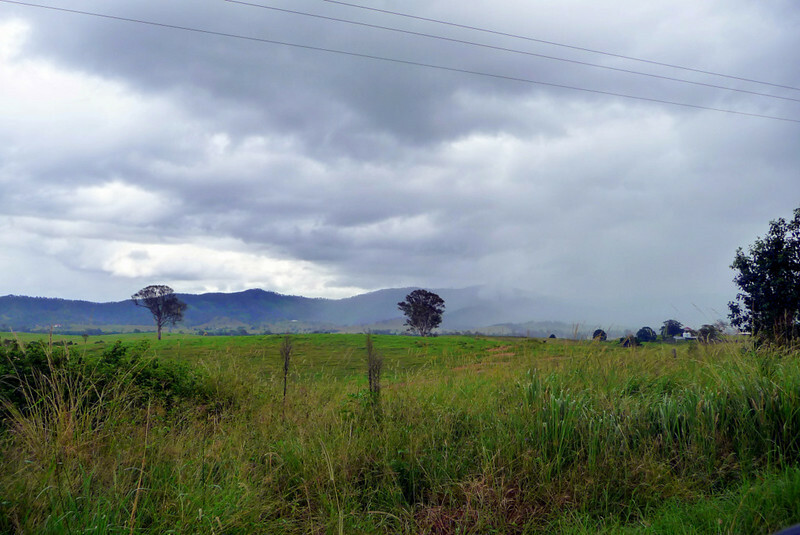 But could I make the short 55 km [34 mi] trip – about an hour's ride – up to George Crooks' place in Beenleigh (south of Brisbane) without getting wet? I was welcomed by a deluge of water falling from the sky. It was all so sudden that I was caught-out across the road at the intersection from George's house, literally within a stone's throw, with an instantly fogged-up visor which made it even harder to identify where the hell I was. What were dry roads one second, turned into rivers of running water the next. I've never been hit by a downpour like it before, ever. I didn't know whether to laugh or cry when George and I finally shook hands. I stayed over for a couple of days with George (and his lovely daughter) waiting for the rain to clear .. and get my soaked-through gear all dried out! 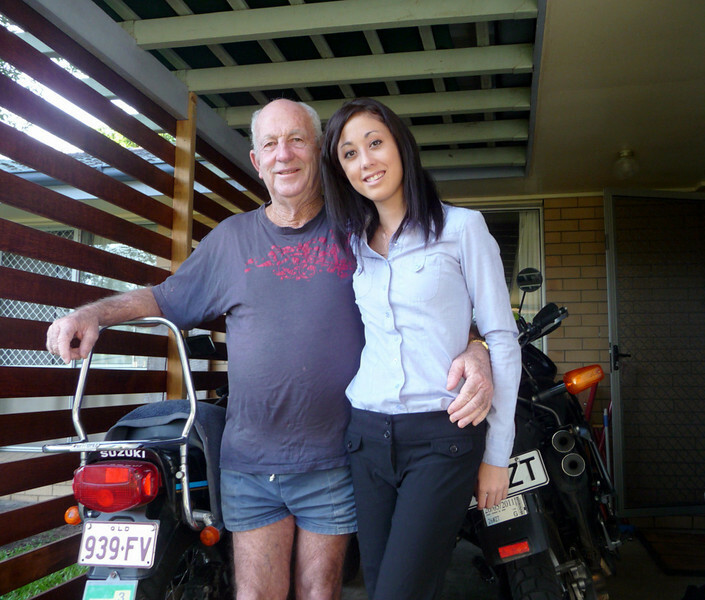 Incidentally, George is another member of Horizons Unlimited Motorcycle Travellers Trust. The weekend finished with a night out at the Brisbane Jazz club, after which, back in Beenleigh, we had some superb BBQ'd rump steaks. 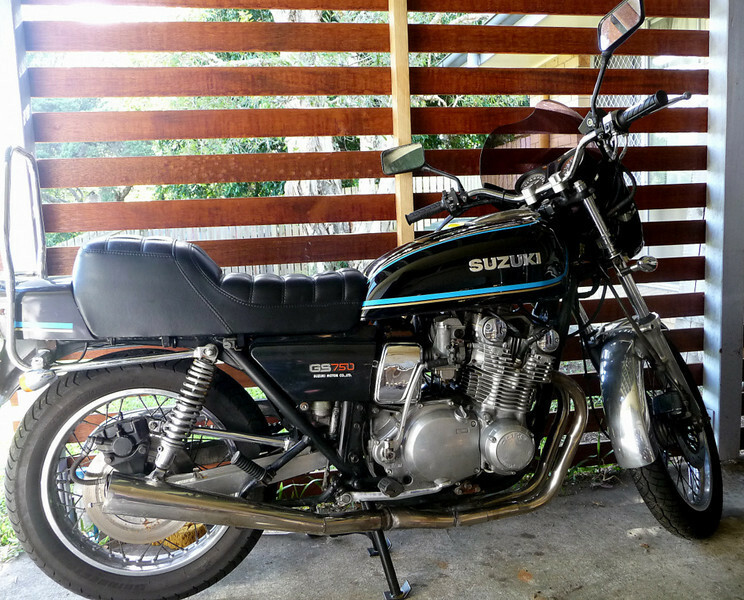 George, the 1977 Suzuki 750 GTS rider - is THE Champion Wonder Steak Barbecue-er of all Australia! Goodbye .. and goodonya mate. Thanks for your hospitality. See in England one day soon, eh? 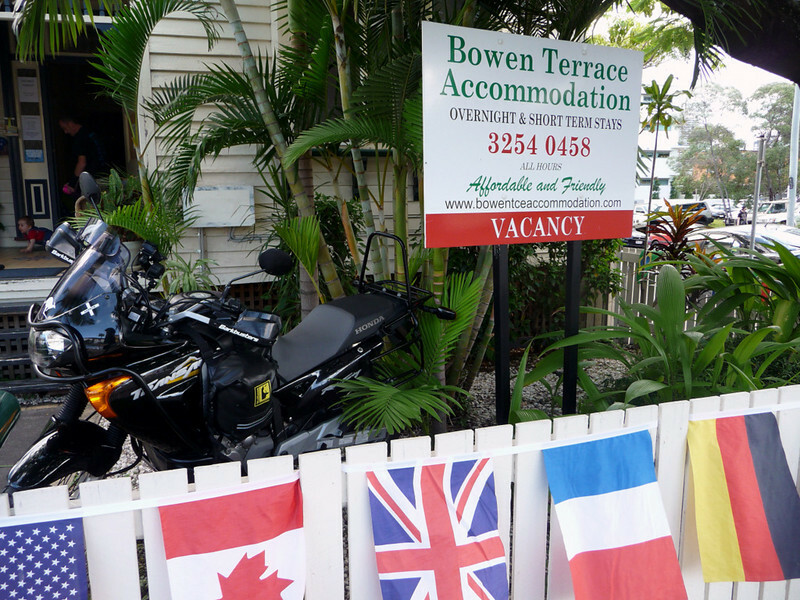 Around midday I slipped back into Brisbane and secured my lodgings, at Bowen Terrace Accommodation, in the New Farm suburb of the City. Call me a sicko if ya want, but I needed to see, firsthand, just how well the recovery process from the recent January flooding had been progressing. Visions from Katrina-hit New Orleans (Louisiana, USA) were still very clear in my mind. Could there be any parallels? 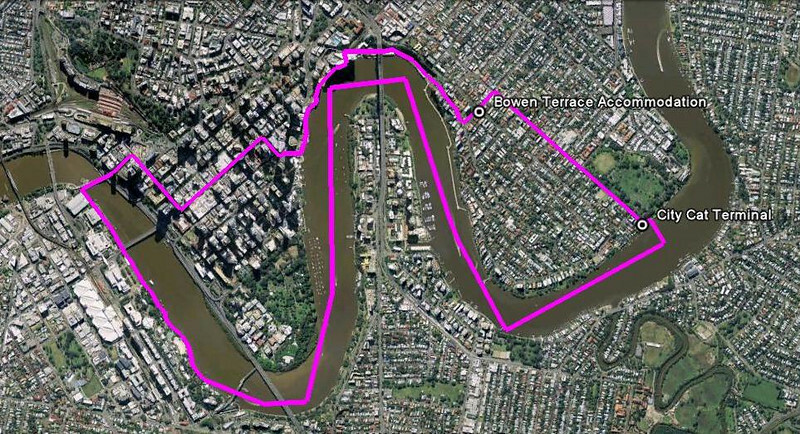 BRISBANE FLOODS : BEFORE AND AFTER - get the high-resolution aerial photos, taken in mid January, by clicking on this LINK. Hover over and drag your mouse pointer across each photo to view the devastation caused by the recent flooding. Assisted by my accommodation's manageress, I/we worked out a 4-hour self-guided sightseeing excursion, which would involve both ferry transport and shank's pony. 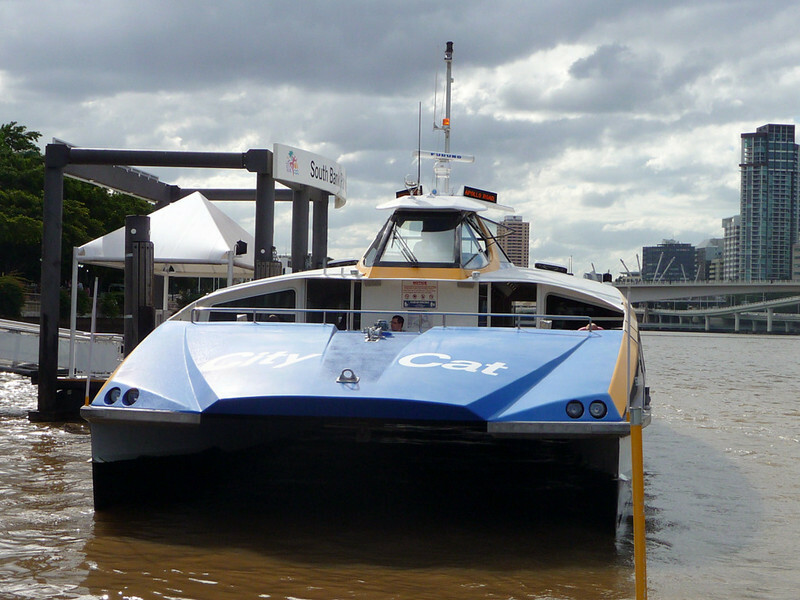 Soon I was embarking on one of a fleet of 17 CityCats operated by Brisbane City Council at the eastern end of Brunswick Street ..
.. that go like the bloody wind. In fact, they're capable of creating their very own wind speed of 25 knots! 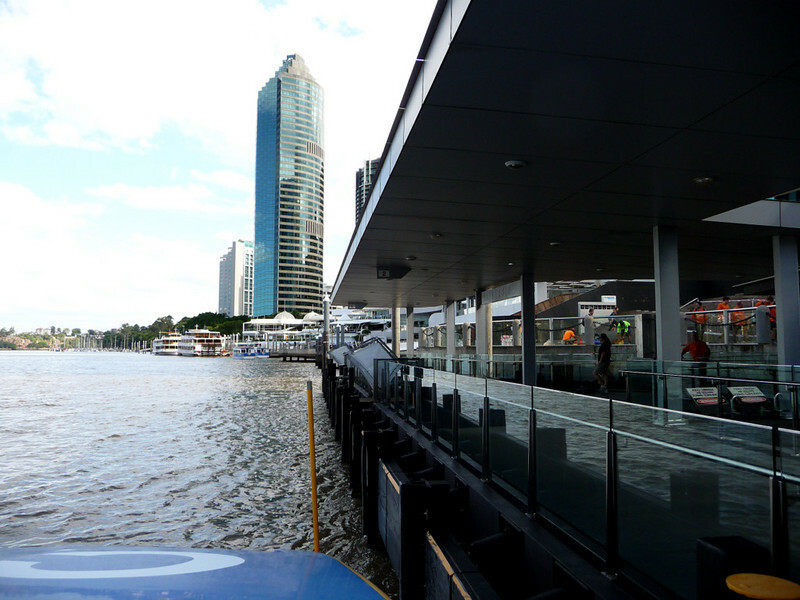 Another ferry terminal along the way. Comparable to, but better and much nicer than a regular bus stop. BUT the City appears, at first view at least, to have completely recovered. Nothing like comparable to New Orleans .. if indeed that is a fair comparison to make [probably not so]. A clear case of: "Nothing to see here folks .. move along please." 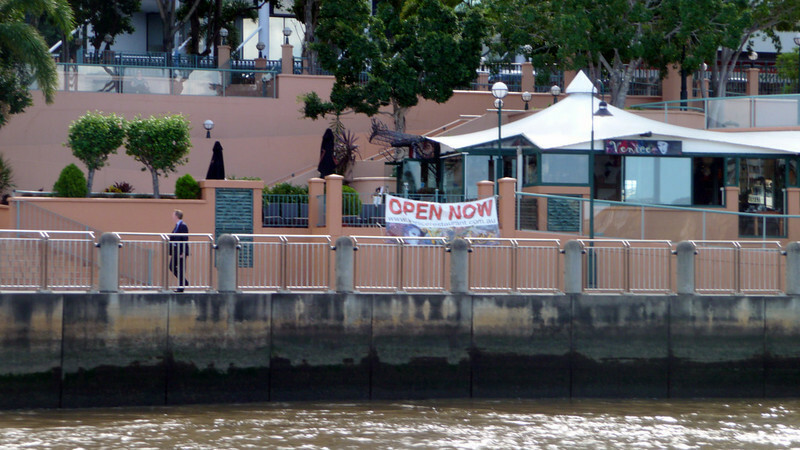 It's business as usual in Brisbane just 2½ months after the devastation occurred..
.. just taking-in the sights and sounds of Brisneyland. 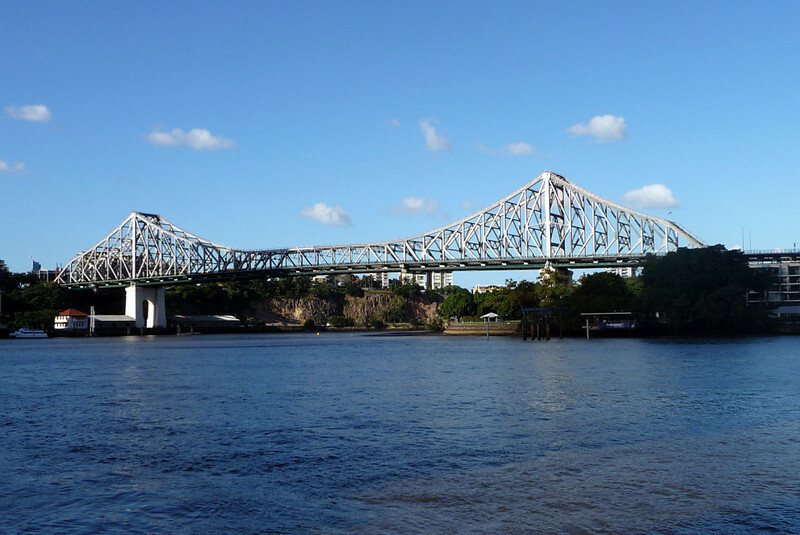 The [cantilever] Story Bridge spanning the Brisbane River. Part of Bradfield Highway. Ahh! .. ain't it great when your thoughts and plans work out. There is nothing like the feeling of a job well done. 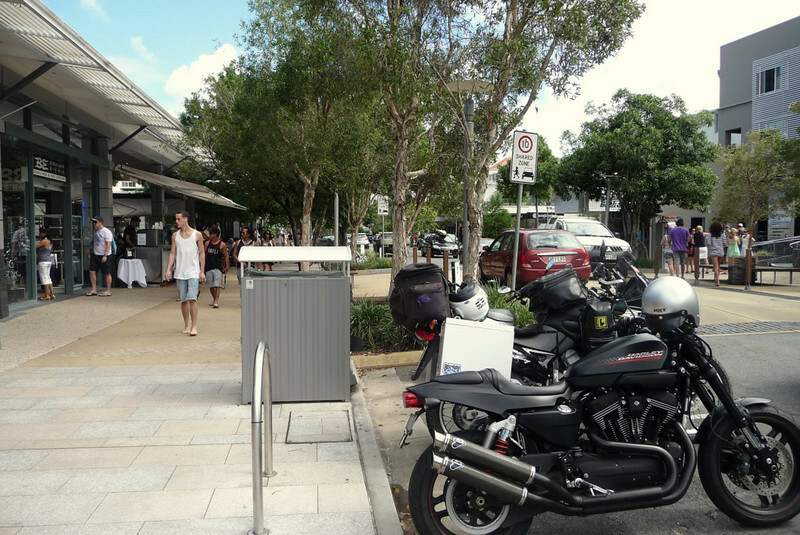 :-) A completely successful day and night out in Brissie. 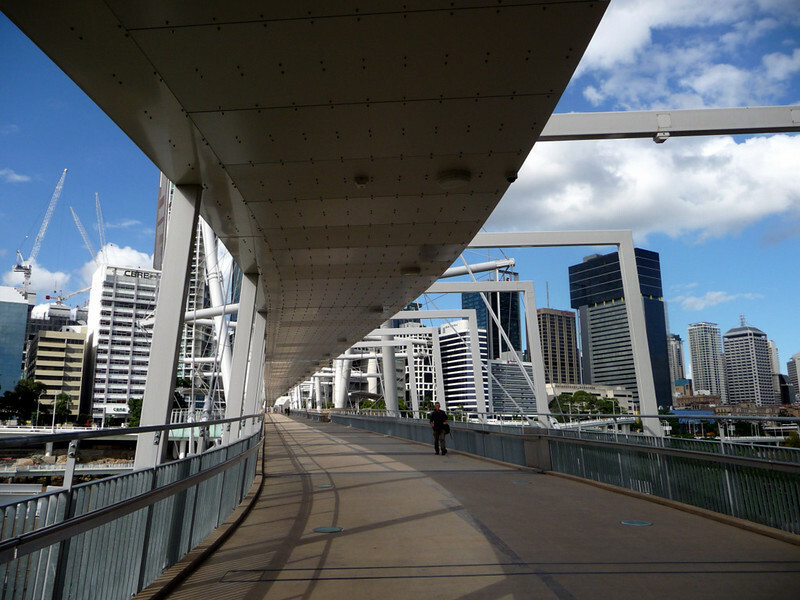 Brisbane is the state capital of Queensland. Plenty of people seem to want to criticise and 'knock' the city, but I have to be honest and speak as I find and say that for a modern place it's quite beautiful, in it's own way. Under-rated, in short. It's clean and organised and has a good atmosphere going on. Completely non-threatening. Perhaps the perfect-sized city; not too big, nor too small; with a population in and around the metropolitan area of approximate 2 million. 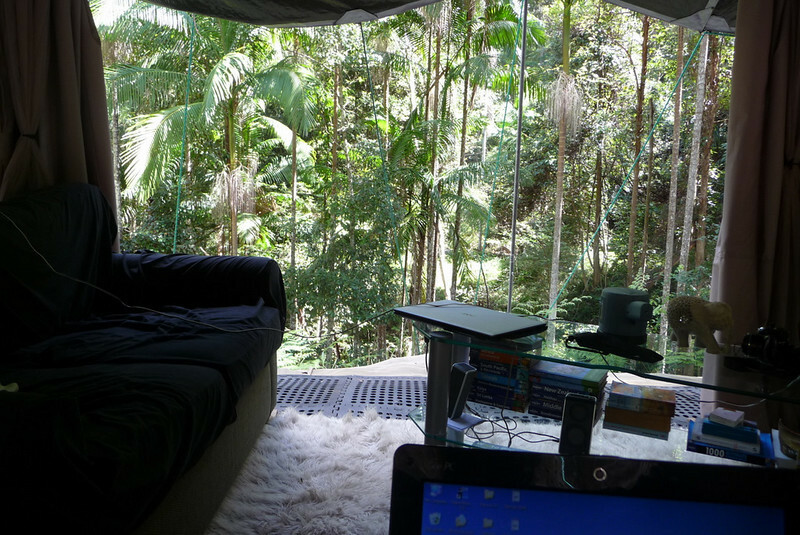 If I was ever to live along the east coast of Oz [very unlikely, of course], and if I was a city dweller, which I'm not, then I could do far worse than settle in Brisbane, Australia’s third-largest city. 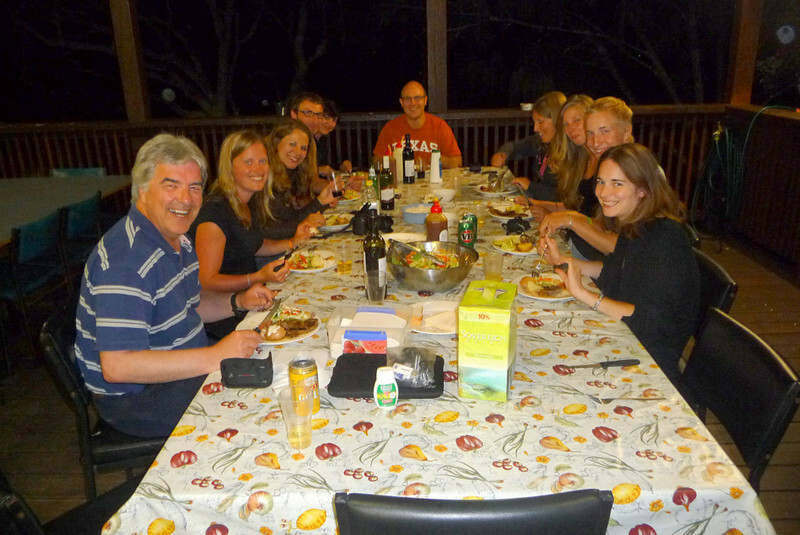 We first met the globe-trotting aussie couple - Peter and Kay Forwood - at the Horizons Unlimited Meeting in Christchurch in the south island of NZ back in late February of 2009. You can follow their amazing travels by clicking on this link. 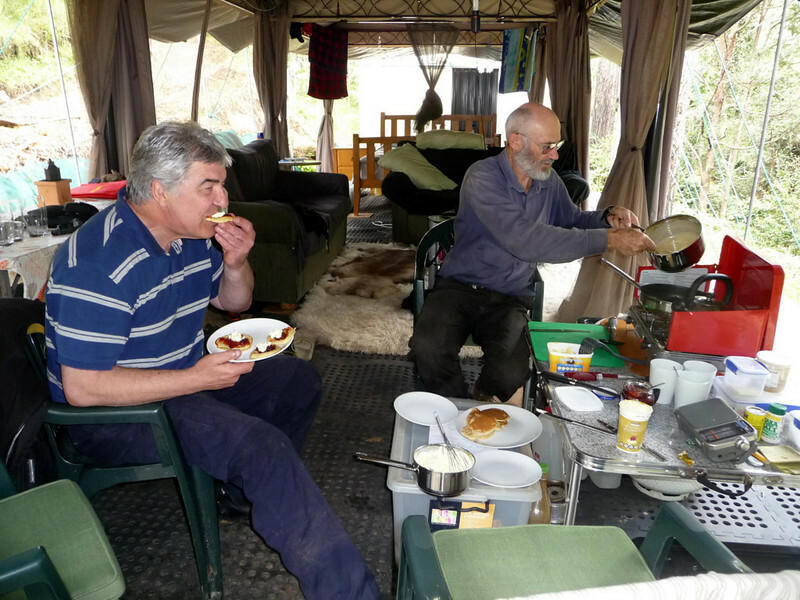 Well, Peter & Kay accepted our offer of hospitality and stayed with us for three nights during mid-June of that same year. 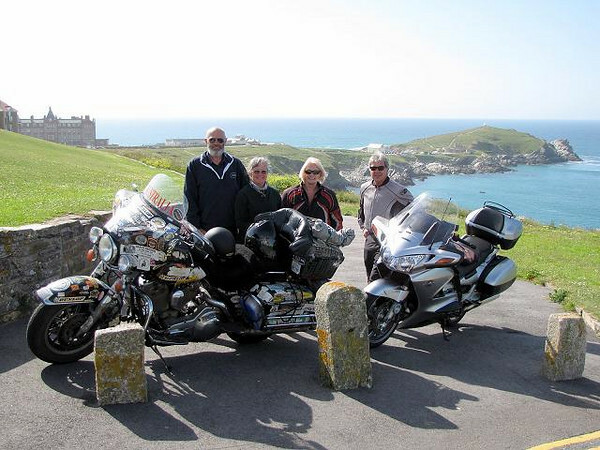 Here we are all together again in Newquay, Cornwall (my home town). And now the time has arrived for me to take-up the reciprocal offer to stopover with them here in their native land. 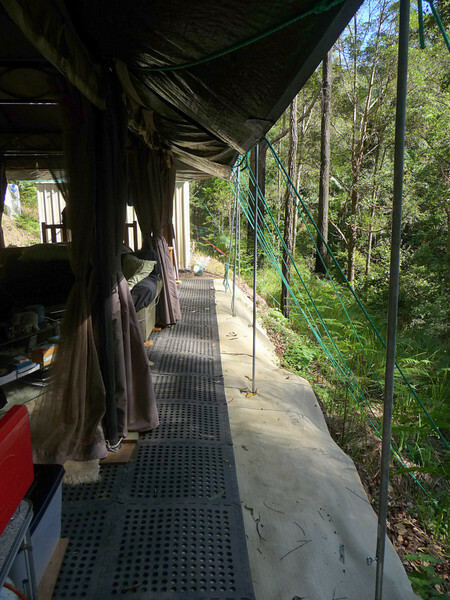 For the record, Peter & Kay are self-proclaimed 'late flowering hippies' .. and with this, plus their totally unconventional approach to life in mind, I'm thinking that I could be in for an interesting couple of days and nights at their new home up in the Queensland hinterland. 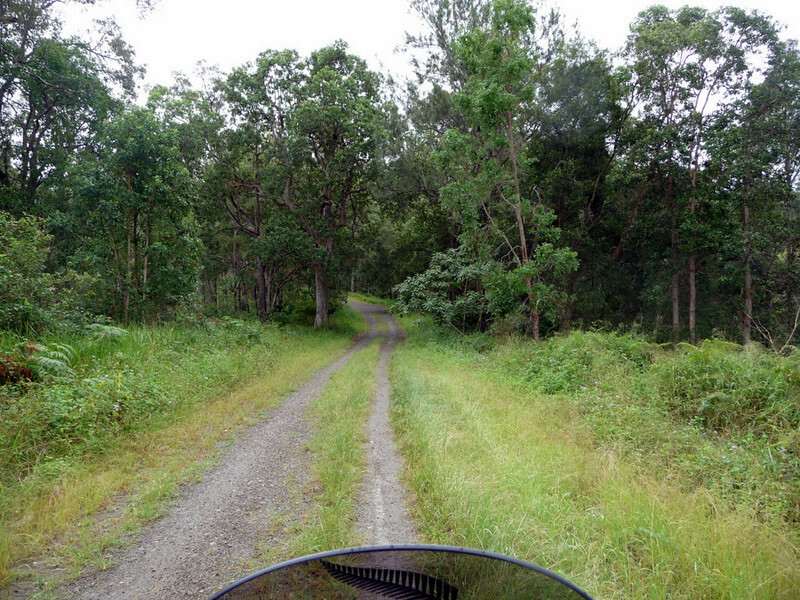 The 120 km [75 mi] northbound journey from Brisbane concludes in a typically rainy fashion .. which made the approach road up to P&K's a little soggy, but still navigable on two wheels, even for a stray pom on a motorcycle, who has no sense of balance! .. miles - sorry kilometres - from any civilisation. This all figures .. and 'bout what I was expecting. 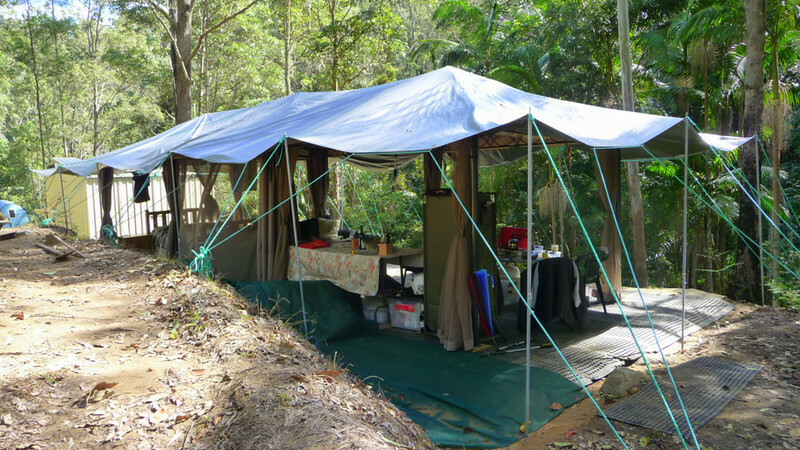 A garden shed with three gazebos strung together constitutes the main residence at Piccabeen Camp - Peter & Kay's new home which they purchased around 7-8 months ago. 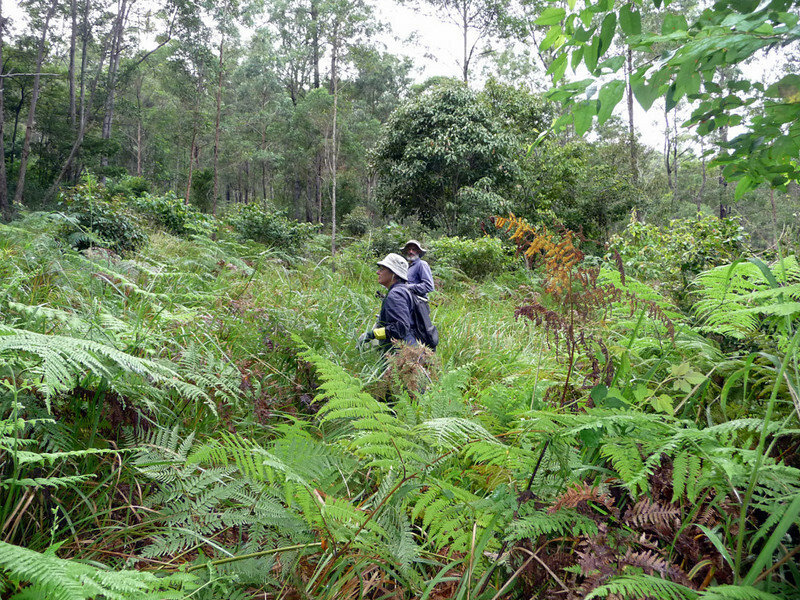 A 'block' of 64 hectares [153 acres] of remote sub-tropical rain forest. Here's the lounge, with its picture perfect outlook .. The main kitchen. 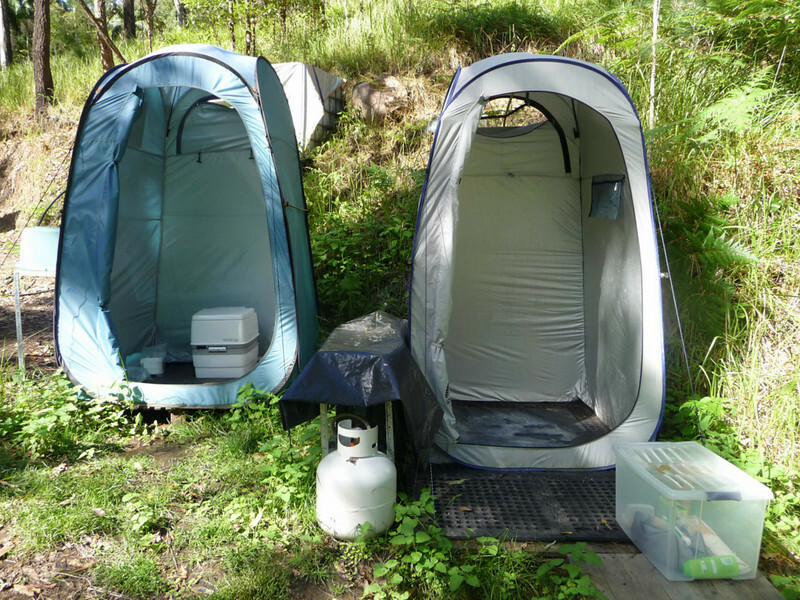 All meals are served 'al fresco' from here, of course ..
.. the dunny can - and the hot water shower unit. 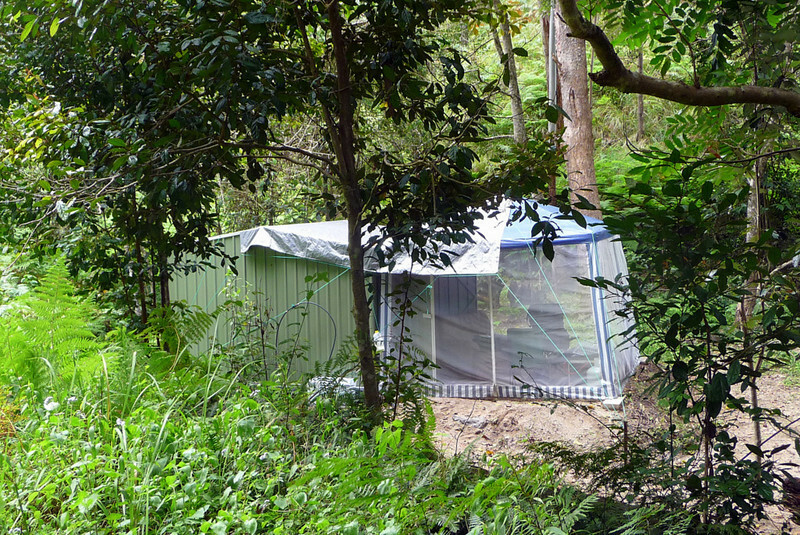 Quite separate, and some distance from the main residence, is located the luxury cabana for visiting guests like me. Dinner consists of a whole roast leg of lamb .. or maybe a shoulder a lamb, we're not quite sure? (not that it matters). Prepared and devoured by just the three of us, over some decent conversation .. plus several sips of red wine. Lovely stuff. When you go to bed at 8:45pm; get an alarm call at 05:30am by a family of laughing Kookaburra birds (terrestrial kingfishers native to Australia and New Guinea), then it's not too difficult to be up and about by 06:15am. 06:30am and we're off up through the valley .. 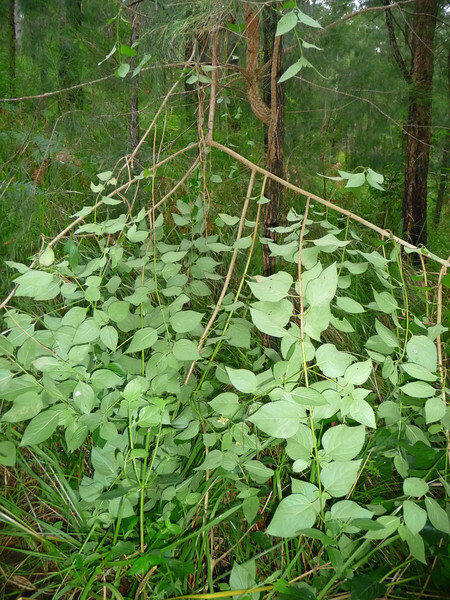 The particular specie of non-indegenous Lantana growing around the Camp is invasive and the spread of the wretched stuff is aided by the characteristic of its leaves, which are poisonous to most animals. 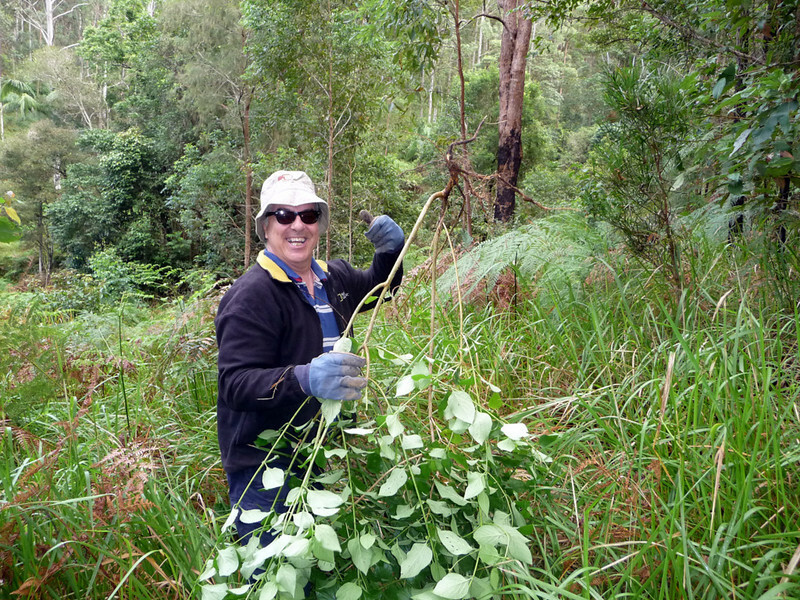 Peter & Kay consider it as a noxious weed and treat it with total contempt, largely because of its non-native status. What on earth is living within the undergrowth here, I kept asking myself? 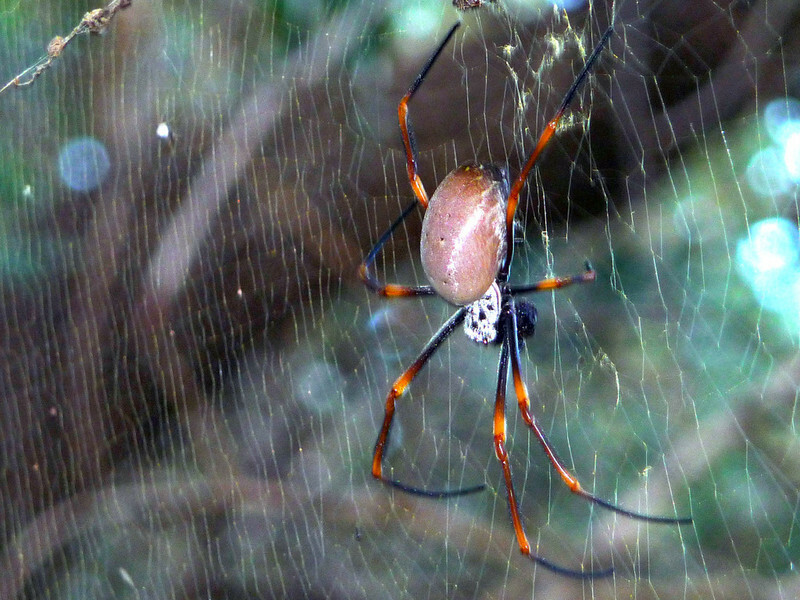 Remembering that, in Australia, if it bites you .. then you're probably going to die! 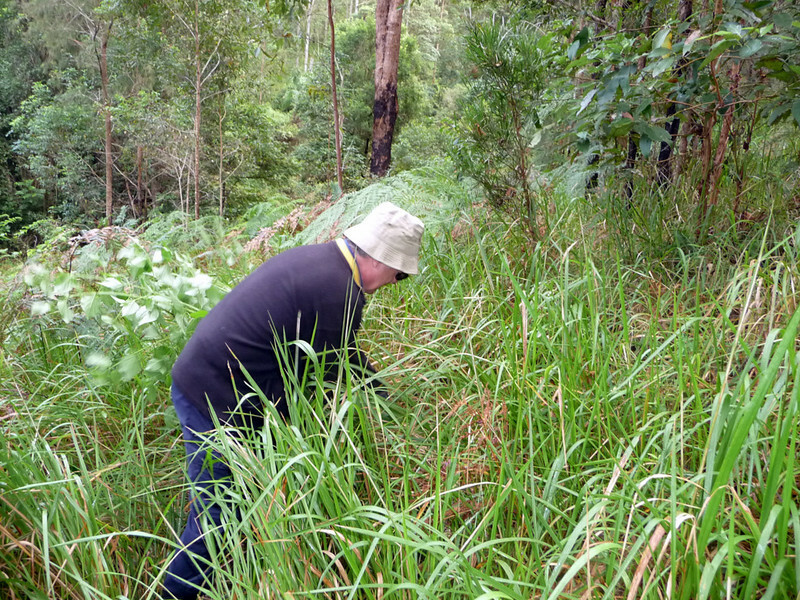 Peter reassuringly shouts across to me at this stage, "Hey Keith, if you see any snakes, then let us know .. as we like to catalogue which species are living around here. Don't think you'll get bitten by any though, as most of 'em are likely to be constrictors." This is what upside-down Lantana plant looks like when pulled from the ground. 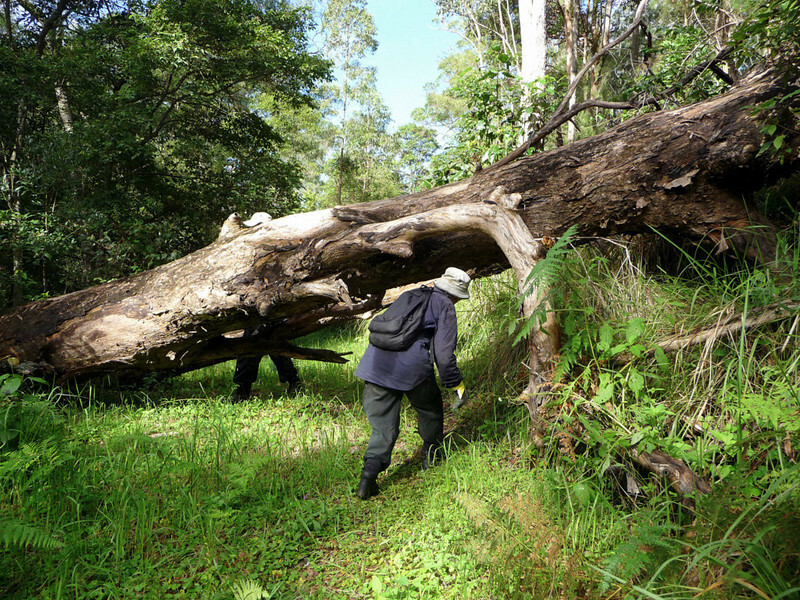 What plants are too big to be dragged out the earth and hung-up to wither and die .. are lopped off with bolt cutters close the ground and the roots then poisoned. Today's Lantana hunt is over. The time is around 09:30am. Breakfast (or a mid-morning snack - I get confused by keeping these sorts of hours!) .. and it's time for tea and 'pikelets' - a kind of small pancake - about 75-100 mm [3-4 inches] in diameter. They are traditionally served in Oz with jam and/or whipped cream. We have both toppings on our fresh warm pikelets. 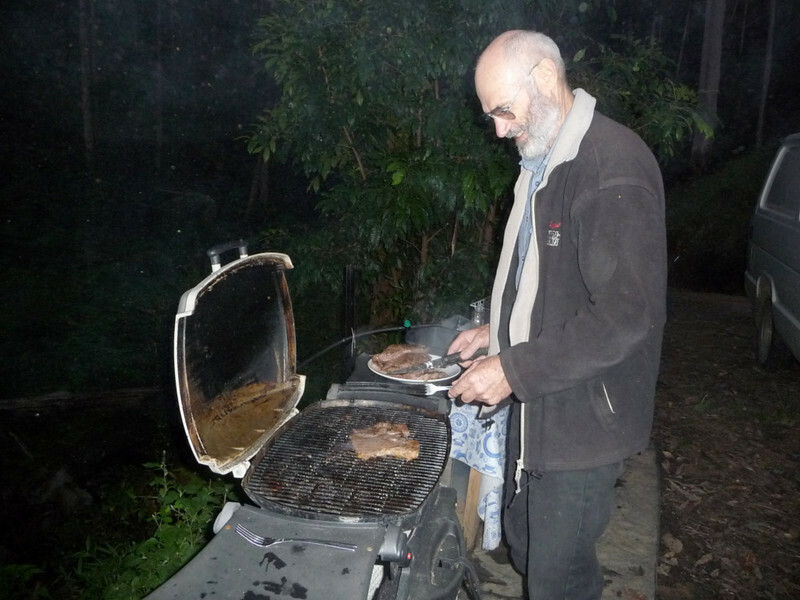 Evening brings more succulent barbecued steaks. Although P&K prefer to live au naturale, they still embrace modern technologies .. and therefore are not wanting for means of electronic entertainment, despite the fact that television reception is nigh-on impossible to receive in Piccabeen Camp (without an expensive satellite dish + subscription costs). 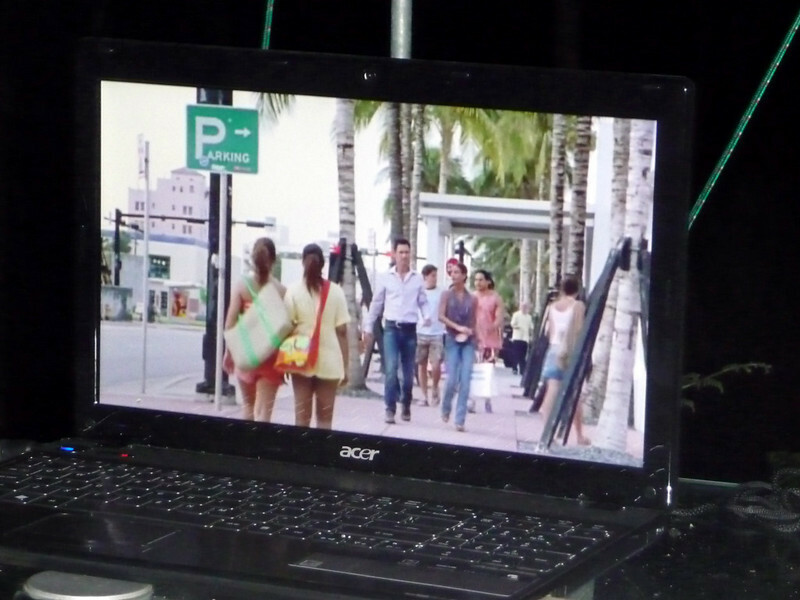 Not that Oz telly is worth watching, in any case. Talking of which, just what can I say about the standard and quality of aussie TV? .. Well, the word 'crap' does spring to mind! Aussie Rules footy games excepted - cuz they're brilliant viewing. That evening the wide-screen computer is hooked-up to the stereo speakers .. enabling the three of us to view just about whatever we want from P&K's huge selection of movies and TV programmes (I'm talking thousands of 'em) on their 1,000 Gb (1TB) External Hard Drive. .. all watched with a few more sips of wine, of course. 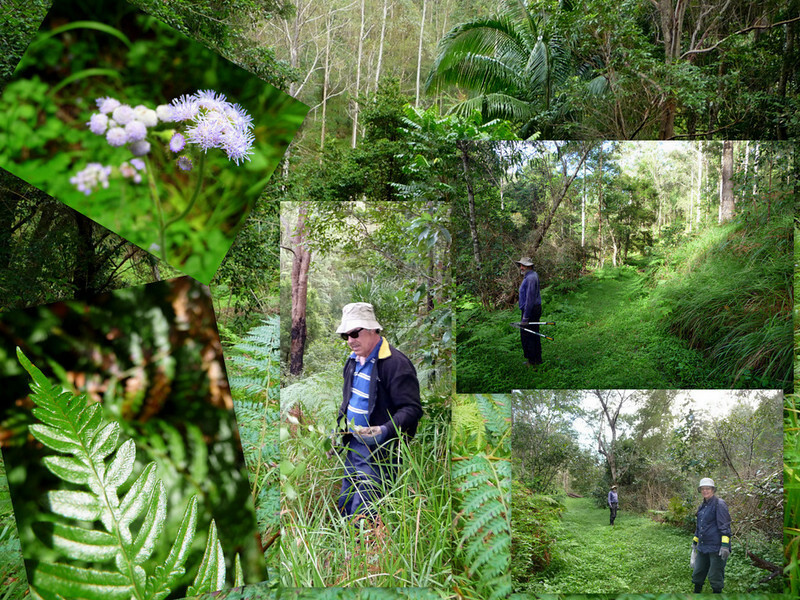 Collage: of my extraordinary memories 'on the block' during the late summer period of 2011. .. and the living is easy. "I'm Not a Celebrity .. Don't Get Me Out of Here!" Sounds like the title and makings of a really good TV reality series? It could catch-on. Everyone should give it a go. Not to be missed. 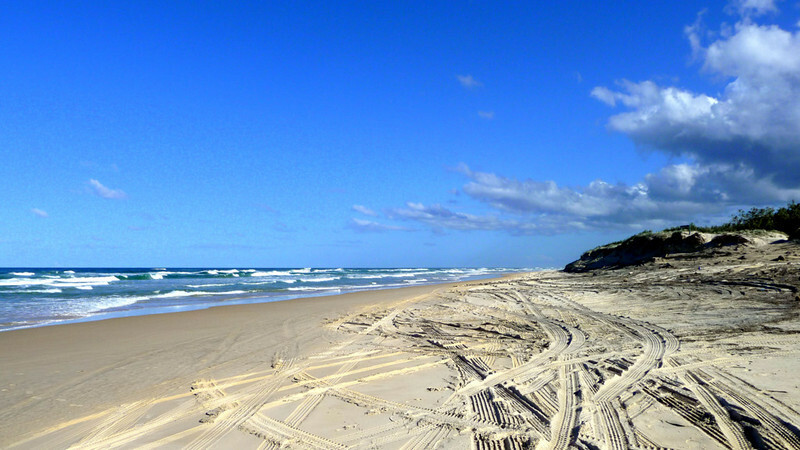 Bribie Island - north of Brisbane - the start of the Sunshine Coast. 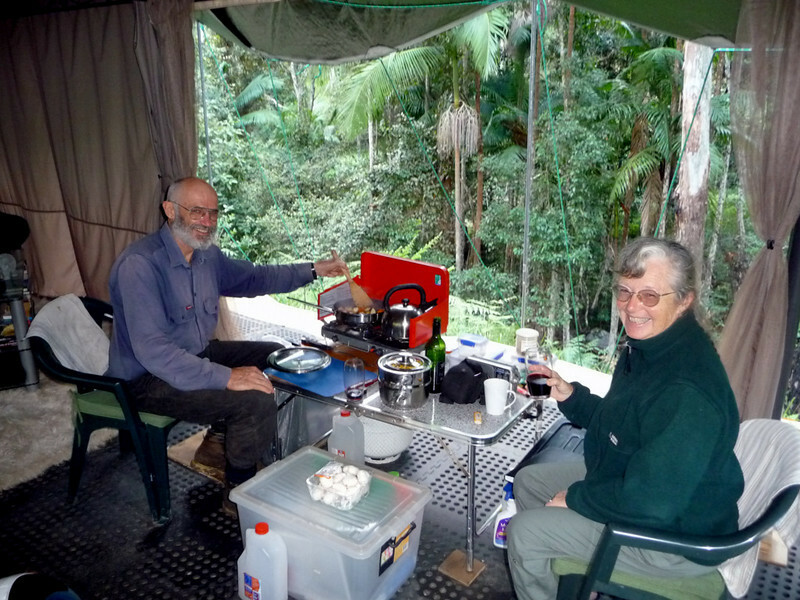 Time to meet Cheryl and David Laing, who are also globetrotters extraordinaire .. kindly and thoughtfully introduced to me by their former Newcastle-based neighbours, David & Lona who, as you know, looked-out for me so well during my time down in NSW. During the early-mid Naughties, Cheryl & David motorcycled overland - not once, but twice - broadly along the same route that I have in mind. Needless to say, I was very keen to meet them and hear all about their fascinating journeys. What is even more remarkable to me is that Cheryl undertook her first trip with very limited motorcycling experience, and in her 50s. 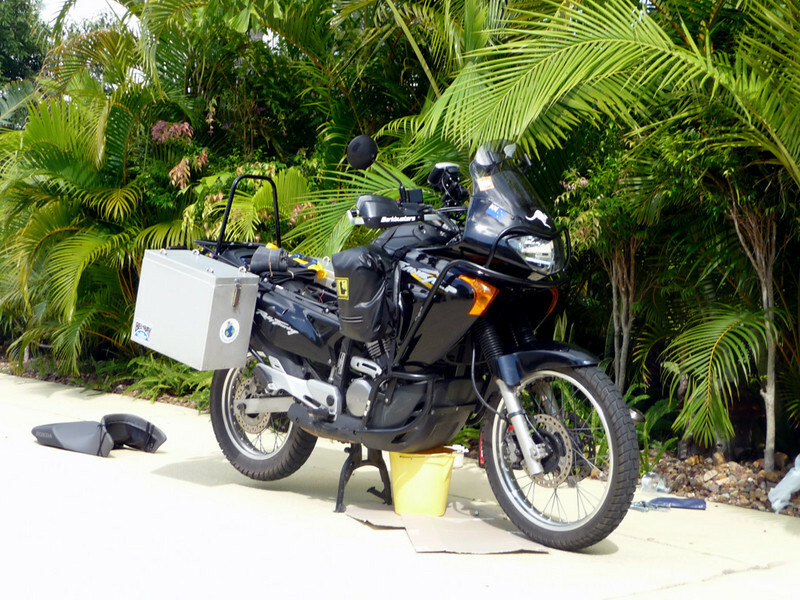 In fact, she hadn't long passed her motorcycle proficiency test before setting off on their first RTW trip. AND they rode Honda Shadows, which for those unfamiliar with the family of two-wheeled machines, are very low-slung cruiser bikes that have little ground clearance. Cheryl & David did it (twice) on a pair of laid-back cruisers. I should be in no doubt, therefore, that my Honda 650 cc V-twin is more than capable of doing the same job .. after all, this is exactly what it's designed and built to do. Cheryl, David and I spent several hours together all told, as she/they fed me with all sorts of incredibly valuable information. What to do, where to stay, what attitude to adopt, especially around Second and Third World countries. 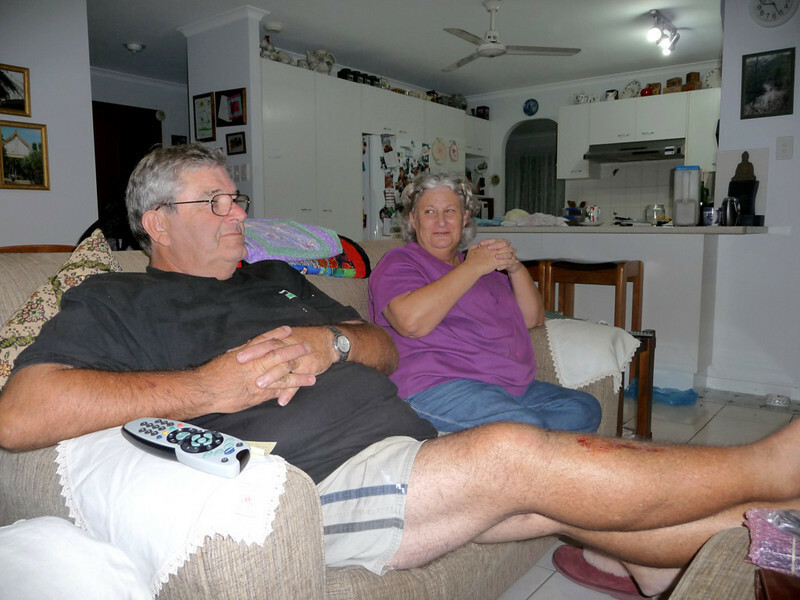 It rained, sometimes hard, quite regularly throughout my two-day stopover with them in Banksia Beach, Bribie Island. For once I was pleased to see it pour down, as this meant we could spend more time together inside .. and in conversation. Now Cheryl & David, in their early and mid sixties, content themselves with home crafts and exotic bird breeding, respectively. I enjoyed seeing David enthusiastically explain what his birds are all about, as we wandered around his aviary between the downpours. Who knows, maybe a third trip is waiting in the wings for them in the future? The Shadows are still there in the garage, awaiting the call .. and the Laings didn't dismiss the possibility. – "You think more of them flippin' pigeons Jack Duckworth, than owt else.. "
– "Flaming Nora! .. can't a fella gerra bit a peace 'round here ..."
Thanks for the respite and valuable information Cheryl and David - and for making me feel part of the family. I'll bet it's idyllic in nice weather. 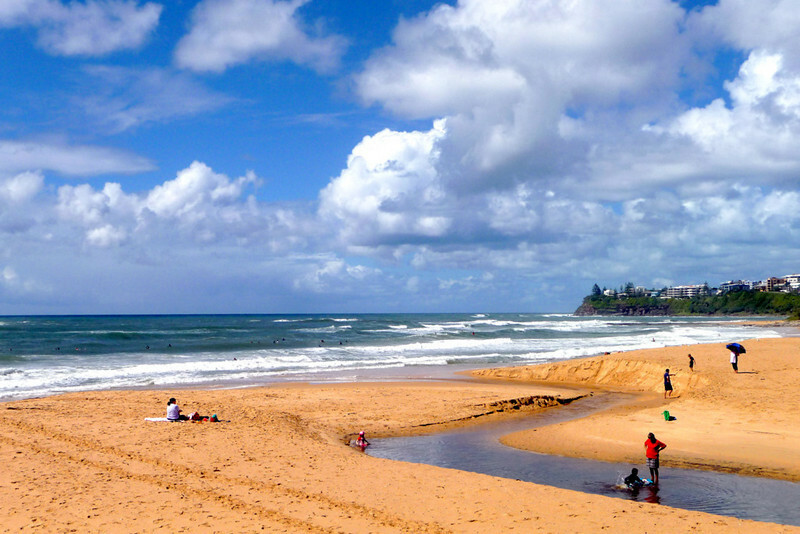 And this picture, of the sky and weather clouds in particular, seems to sum-up my experience of The Sunshine Coast .. which for me, at the time I visited the region - much like its southerly neighbour, 'The Gold Coast' - should be renamed 'The Could-P!ss-Down-At-Any-Moment Coast' .. !! Not to worry, as I still had a great time in the regions despite the inclement conditions. 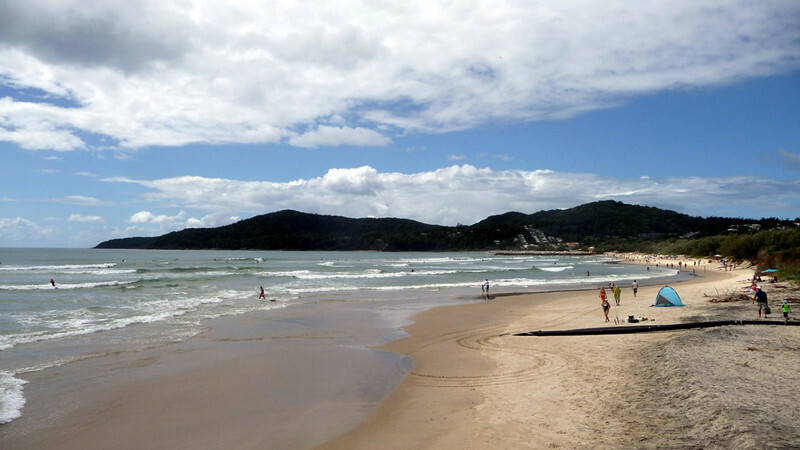 I make my way further north to Noosa Heads for the night. 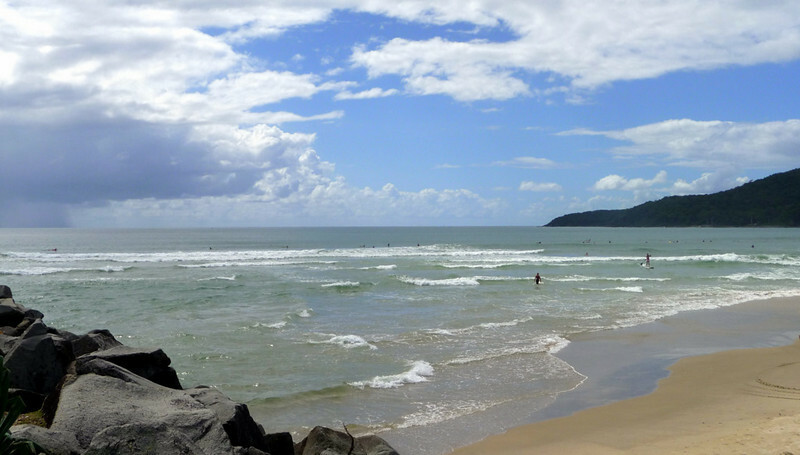 Noosa, proclaimed as being in the heart of the sun, surf, fashion and café culture. Better go take a look, eh? Looks great down the beach ..
.. until you look out to sea - and notice that a nasty squall is threatening to move inshore. Breakfast at Aroma's on Hastings Street, Noosa Heads .. with it's European-style seating where all chairs face the sidewalk. Quite chic and a little bit funky. 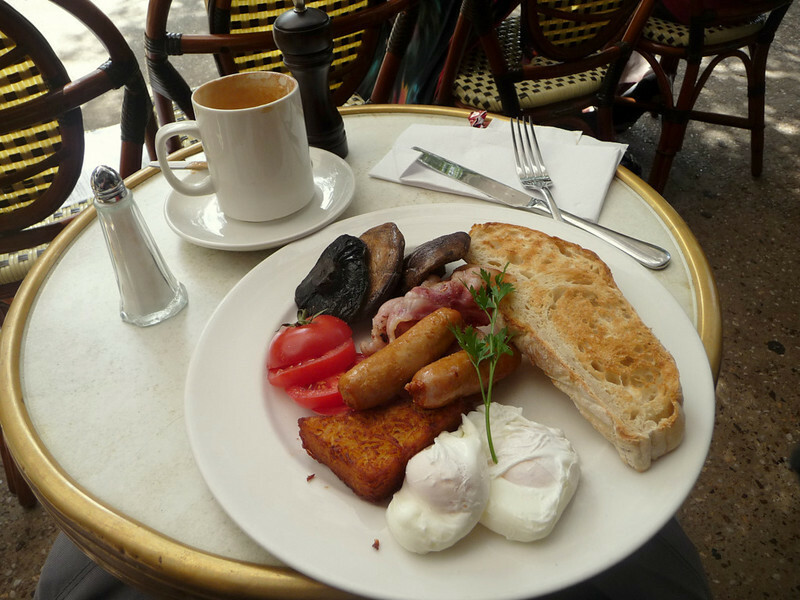 If you're into the caffè latte scene or want to sip a glass of overpriced wine and watch the world go by, or want them to watch you - then Aroma's is the place to be. 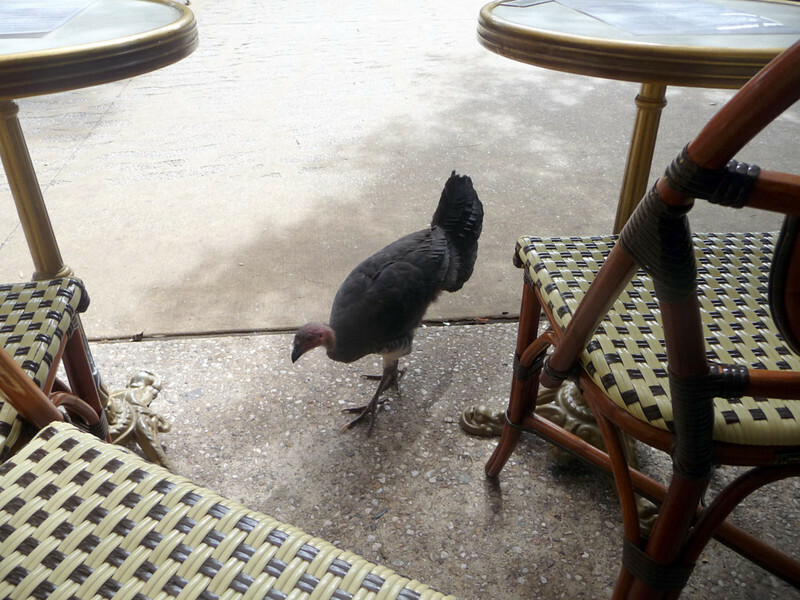 Christmas dinner takes a walk on the wild side - right under my wobbly table! Then I remembered my recent conversation with Cheryl Laing back on Bribie Island about Third World poverty .. and it occurred to me that I had just spent a not inconsiderable amount [AU$33], which is the equivalent of more than a month's wages to lots of poor folk around the world, just on a plate of brekky. 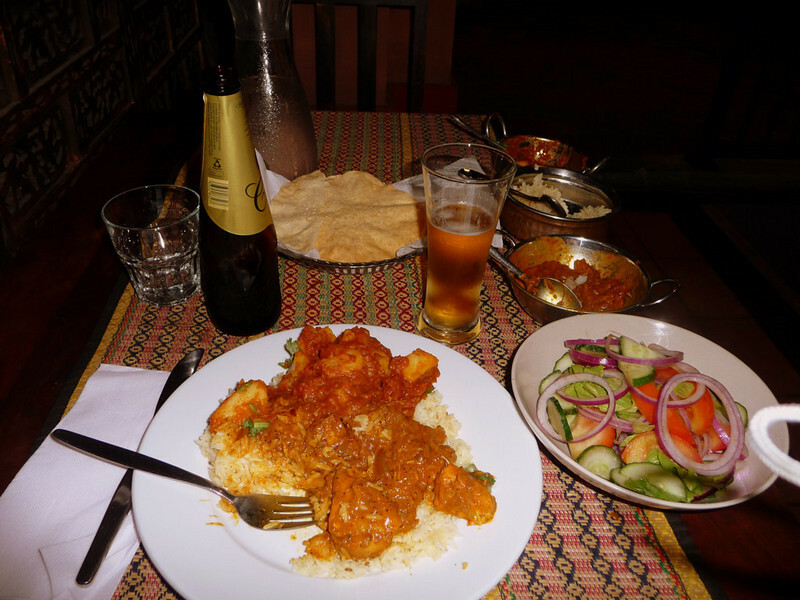 I felt a little guilty [and slightly ashamed] because of my over indulgence .. 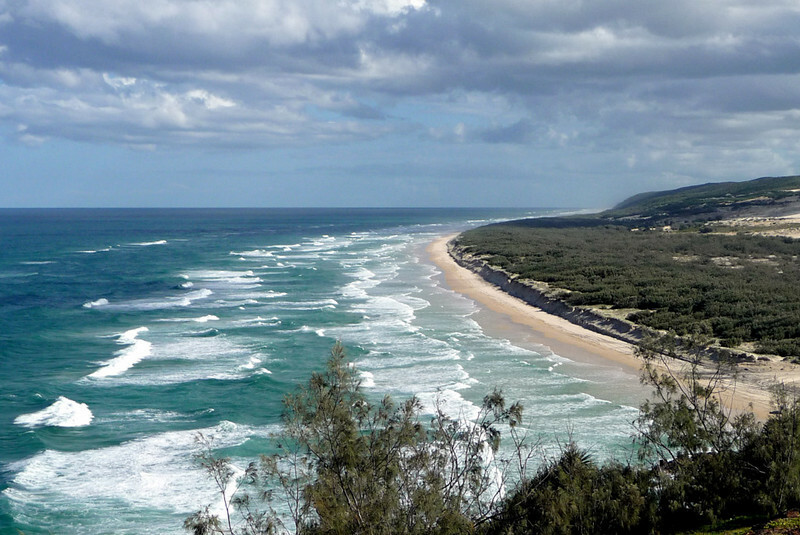 But we must move on northwards - to Rainbow Beach. .. where things are perking up a bit .. as I realised that it hasn't actually rained for a couple of days now. The threat of precipitation is still ever present, but it seemed to me that I'm moving away from the darker clouds yonder, to the south. This view is looking back southwards in the general direction from where I have travelled from. Debbie, my outstanding landlady at Rainbow Beach, as dusk starts to fall, takes me in her ute to the Sand Dune area of the town .. 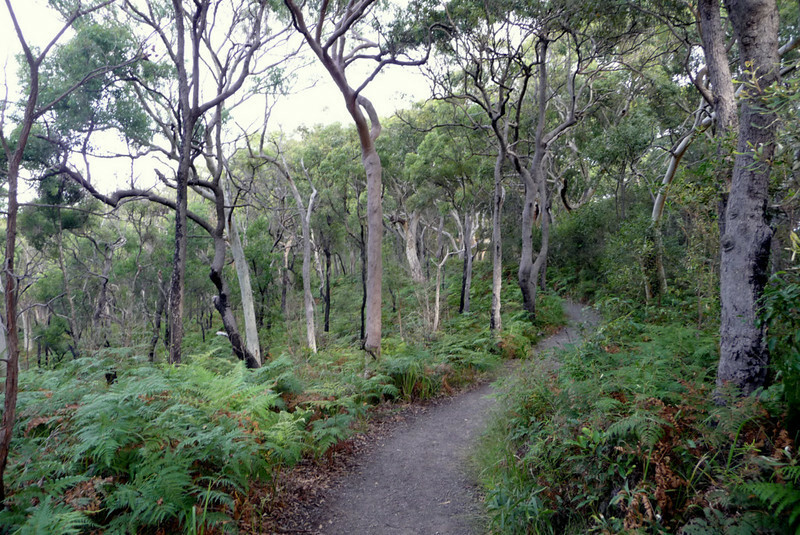 I have to walk the last 500 metres or so through forest. 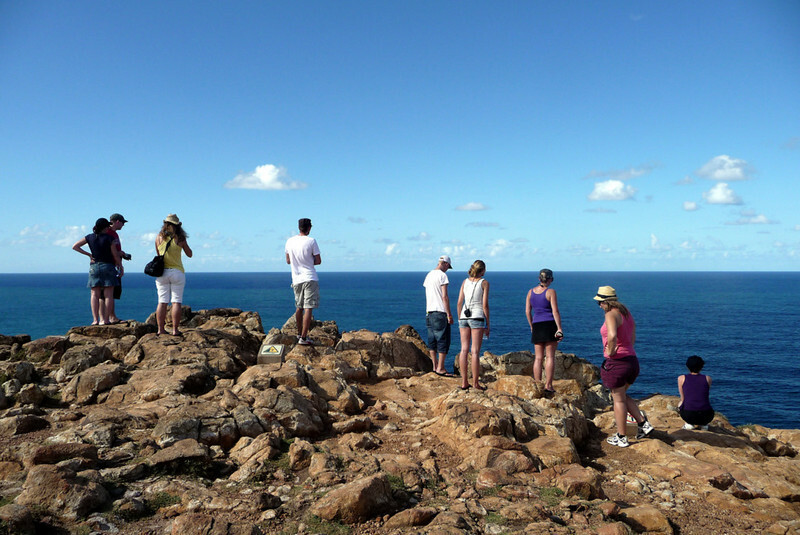 Looking out to sea - it's quite a sight. The squalls are staying offshore, thank goodness. The largest sand island in the world, stretching 123 km long and covering an area of 166,038ha. World Heritage Listed in December 1992. 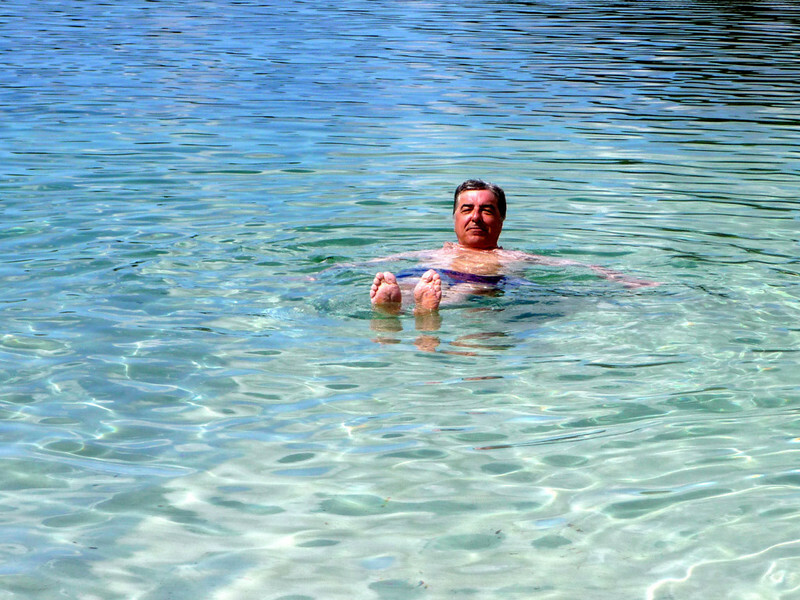 Sits on a huge reservoir of fresh water. Has over 40 freshwater lakes and is home to half of the known 'perched' lakes in the world. 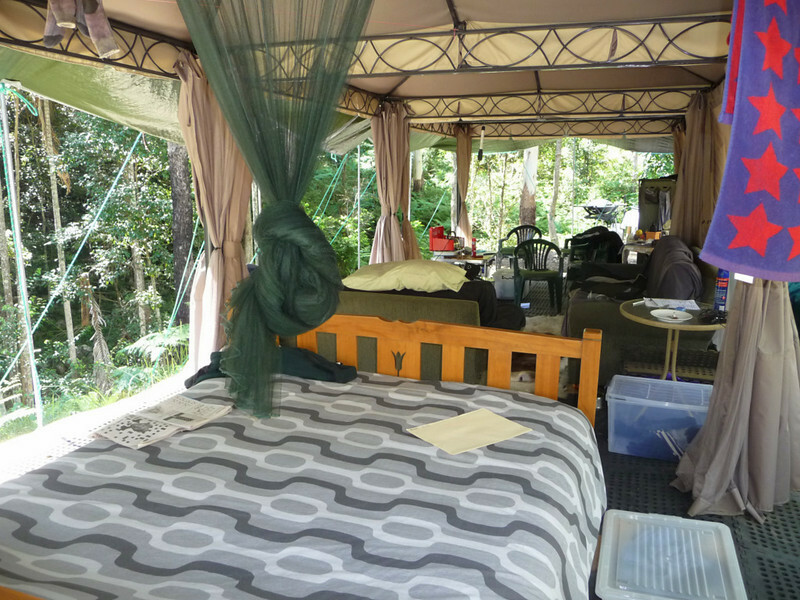 The sand on the Island contains no significant nutrients, yet Fraser is composed almost entirely of vegetation covered sand and boasts towering rainforests at elevations of over 200 metres high. 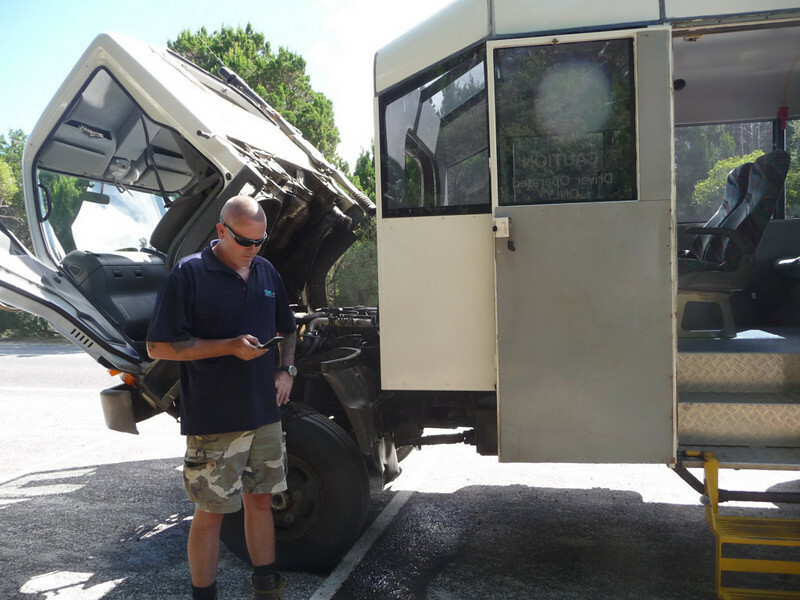 And before we had even left the mainland, just before reaching the ferry at Inskip Point, our 14-seater purpose built 4x4 bus breaks down. BUGGER! 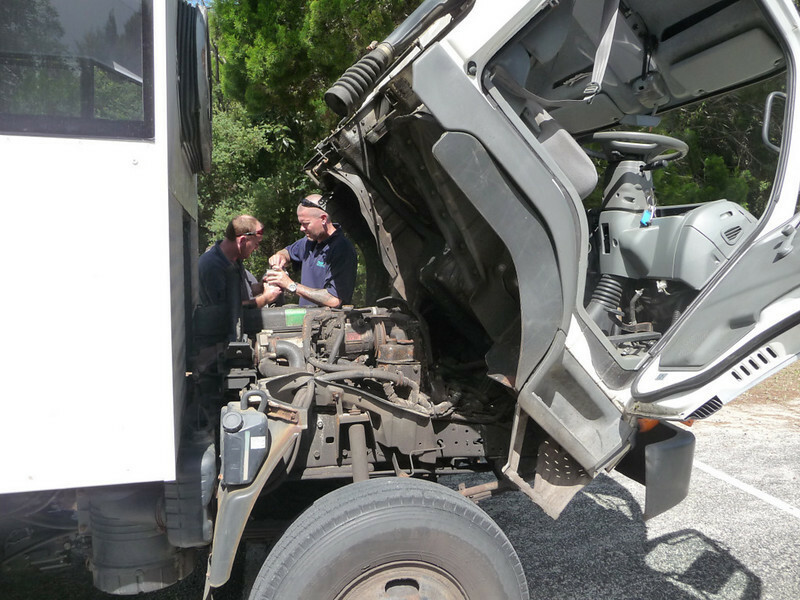 The fuel filter is p!ssing out diesel at a rate of knots, which prompted Ian, our driver/courier/chef/fixer throughout the 2-day excursion, to call for back-up .. like a mechanic, with the right spare part and tools for the job in hand. The threat of the whole tour being cancelled, is very real one .. which would have been a pity, as the stormy weather forecasted for the day (Monday-11th) was on the wrong side of losing a battle with the sun, I am pleased to say. 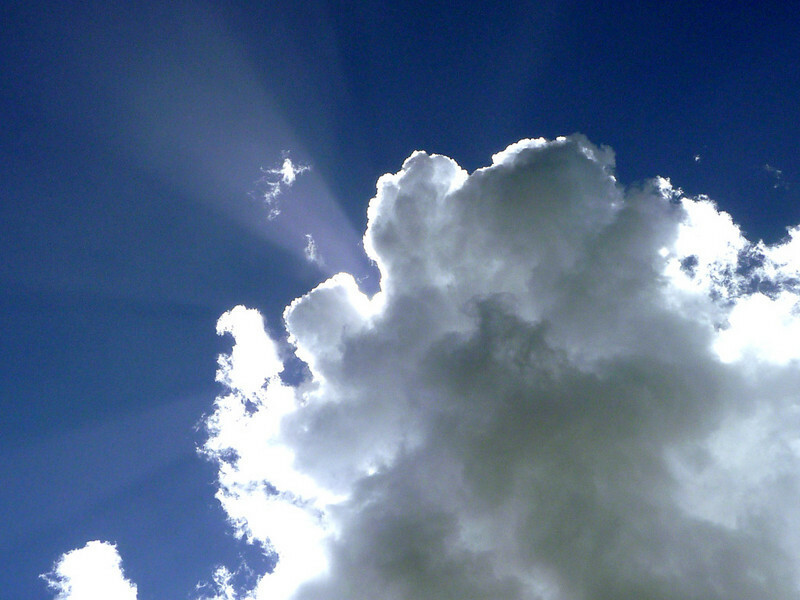 Hip Hip Hip Hooray - The sun has got his hat on - and [I think] he's coming out to play! However, the problem is temporarily fixed ..
.. and despite the delay of around 90 mins we embark the ferry (called a 'barge' at Inskip Point) and make the short (circa 1 - 1½ km) 10-minute crossing to the southern point of Fraser. 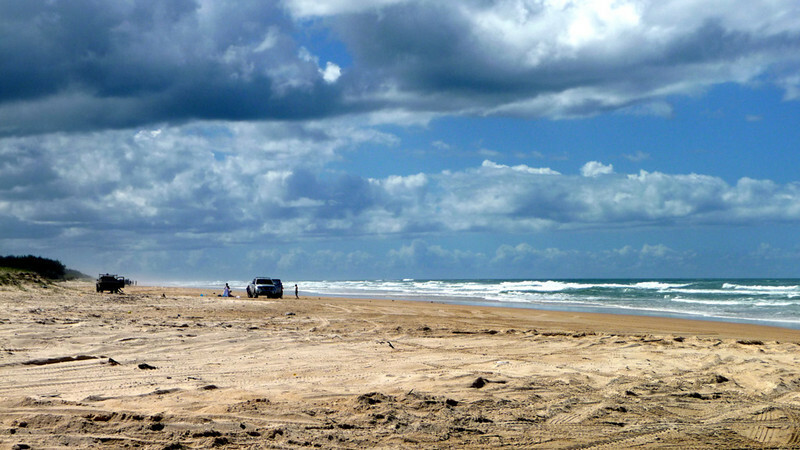 There's a lot of very serious 4x4-ing happening over on Fraser Island - I'm glad I decided to leave the bike on the mainland! 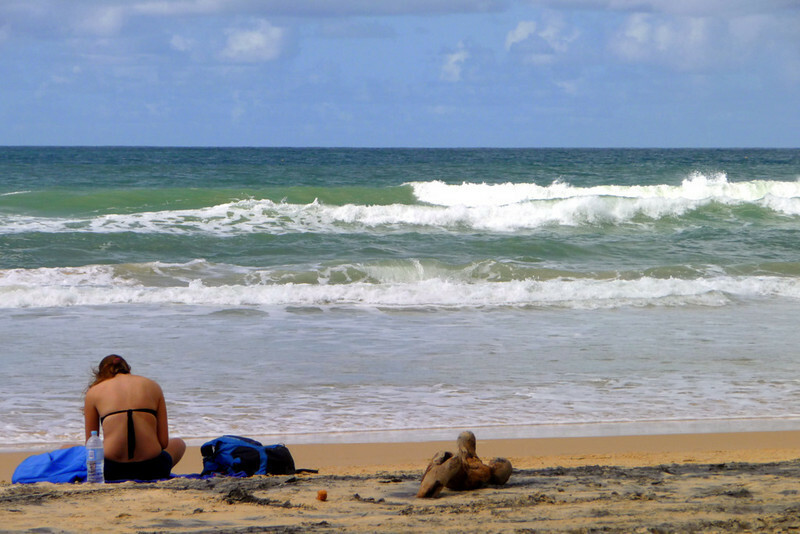 As we travel northwards at the waters edge up Seventy-Five Mile Beach on the eastern seaboard of the Island alonside an endless line of breakers rolling-in from the Pacific. 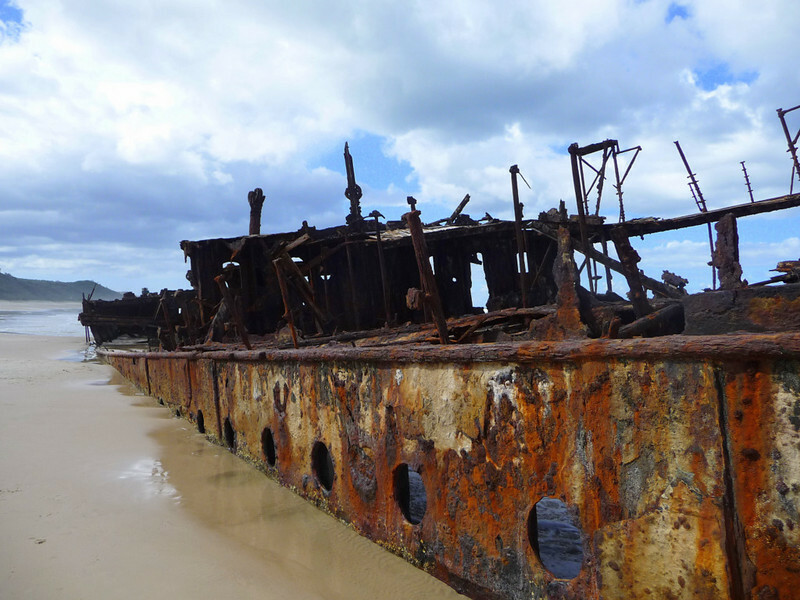 Soon a dark object began to emerge from the salt-haze ..
- the wreck of the Edwardian ship "S.S. Maheno", lying half-buried between ocean and beach. 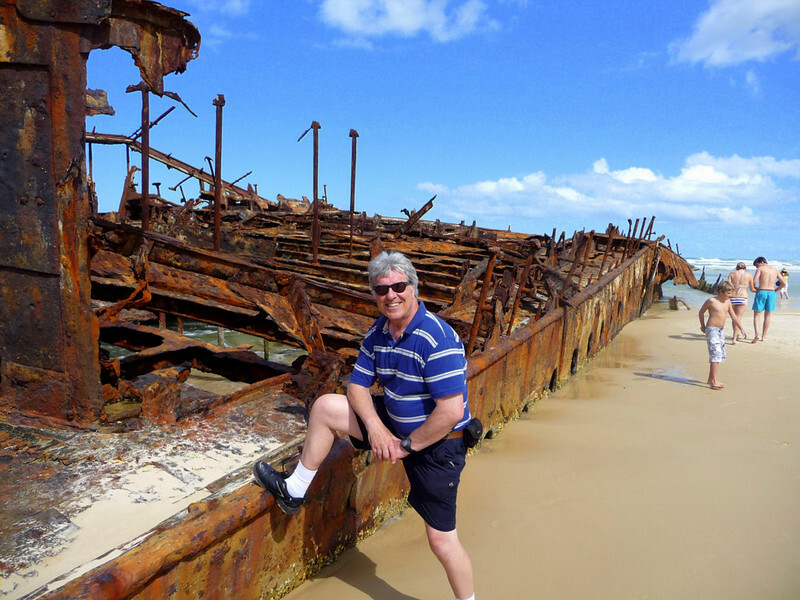 Once a proud passenger liner, now little remains but a rusting skeleton since it was washed ashore nearly 76 years ago in July 1935. 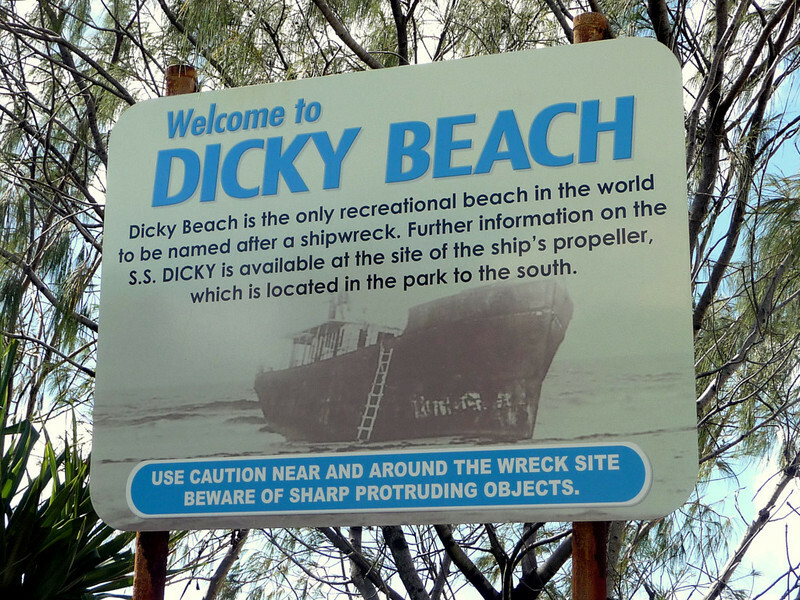 A salutary lesson of the 'permanence' of man-made objects. 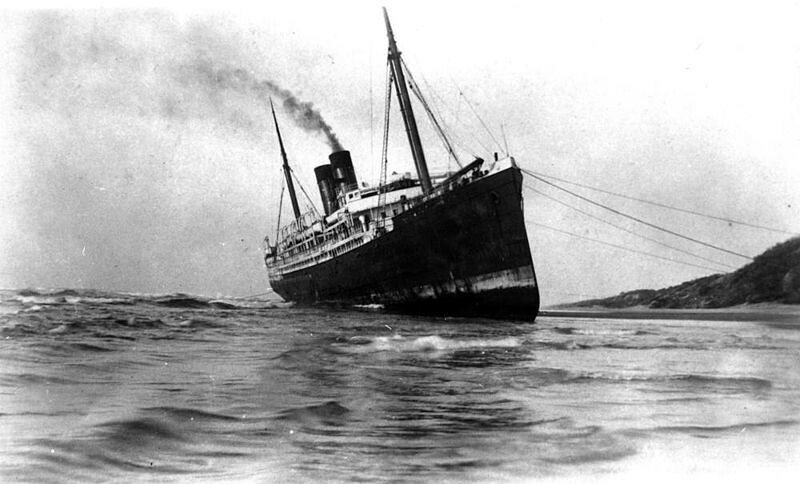 A 1935 photo of the beached "Maheno"
Further up the coastline we stop at Indian Head, which is the most easterly point on Fraser, rising 60 metres [195 ft] from the sea. Here are my travelling companions .. doing a spot of whale watching. Looking back down 75-Mile Beach from the same spot (to where we came here from). The Indian Head climb completed, it's time to turn around and head back south down the beach highway. Dusk arrives early at these latitudes in the Southern Hemisphere at this time of year. We're stilling running about an hour behind schedule. On the way back to our overnight accommodation at Dilli Village, we spot a couple of Dingos - probably young siblings (brother and sister). The dingo population on Fraser is regarded as the purest strain of dingo remaining in eastern Australia. 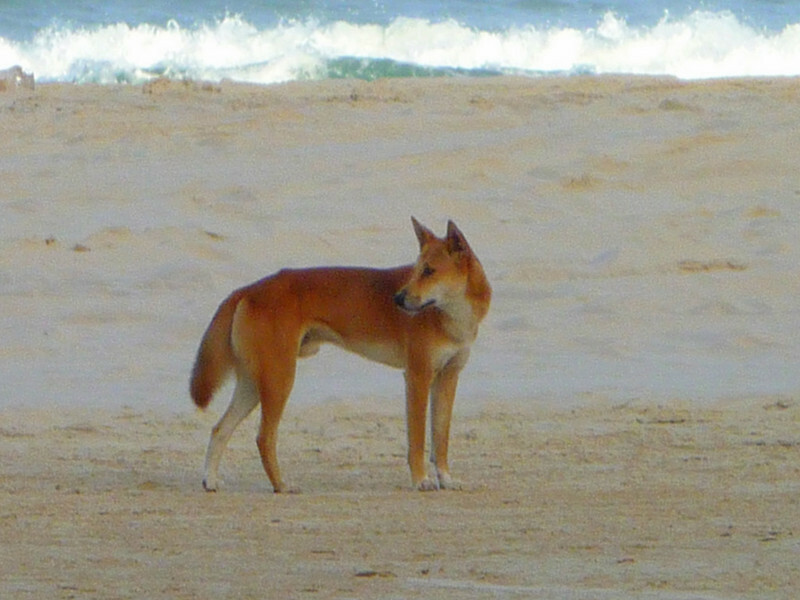 There are no domestic dogs allowed onto the Island, for fear a cross-breeding with Fraser's pure-bred dingos. 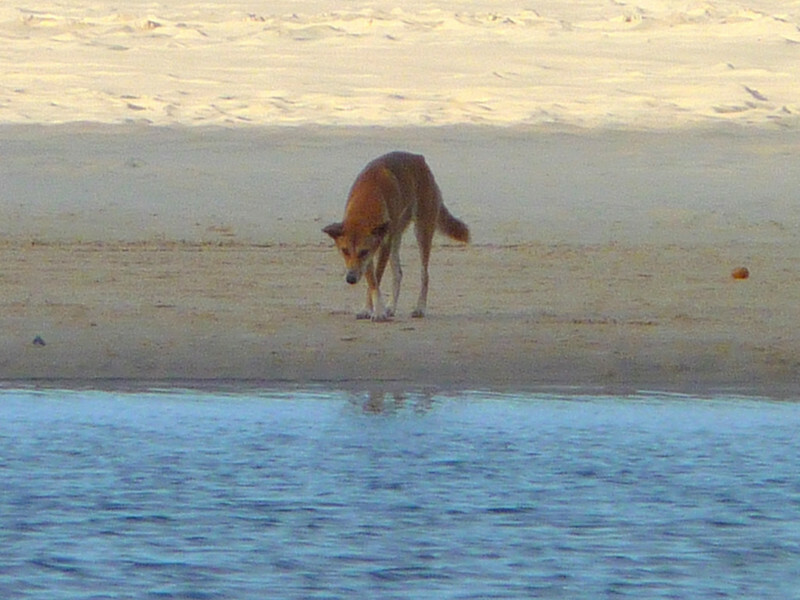 Fraser Dingos were once used by Aborigines to flush out game. .. and there's no-way I would ever turn my back on one of these wild SOBs! I am the oldest of our little group of ten .. by quite a margin. Seems to be a situation I find myself in more-and-more nowadays! From all across Europe. They're a good crowd of young folks though - and we all get on well. My sometimes juvenile approach to life does bring its advantages from time-to-time! 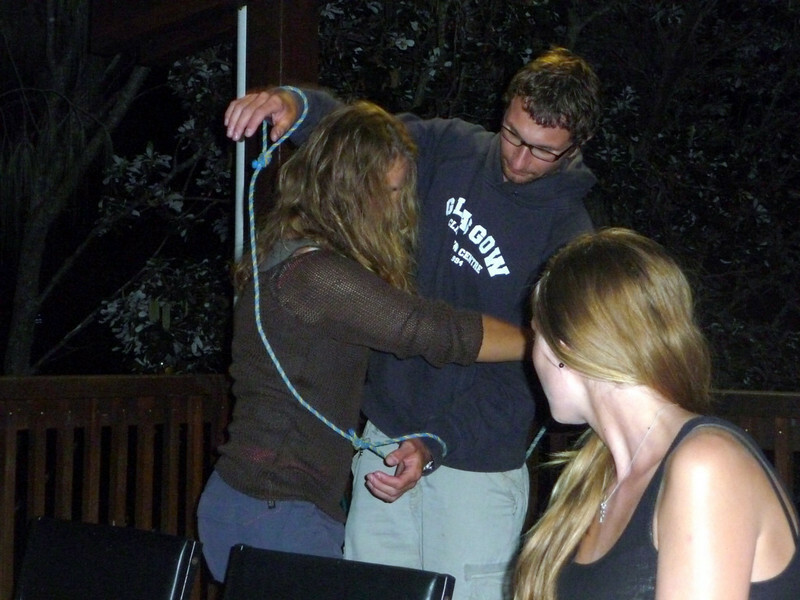 Ian (tour guide) conjures-up some silly games to play ..
.. with a length of string. Time for bed, for an old timer! 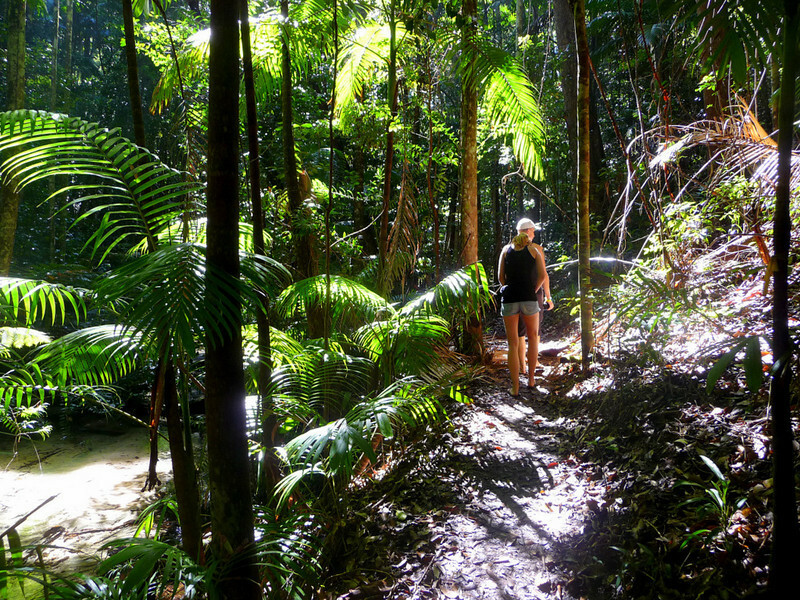 From Central Station we all take a 45-minute hike along Wanggoolba Creek in the middle of Fraser's rainforest. The climb up out of the valley towards the end of this brief expedition nearly brought on a heart attack for me. BUT I was determined not to show my age .. so I kept going. After getting my wind back, I calmly remarked, "Good aerobics session, eh chaps?" 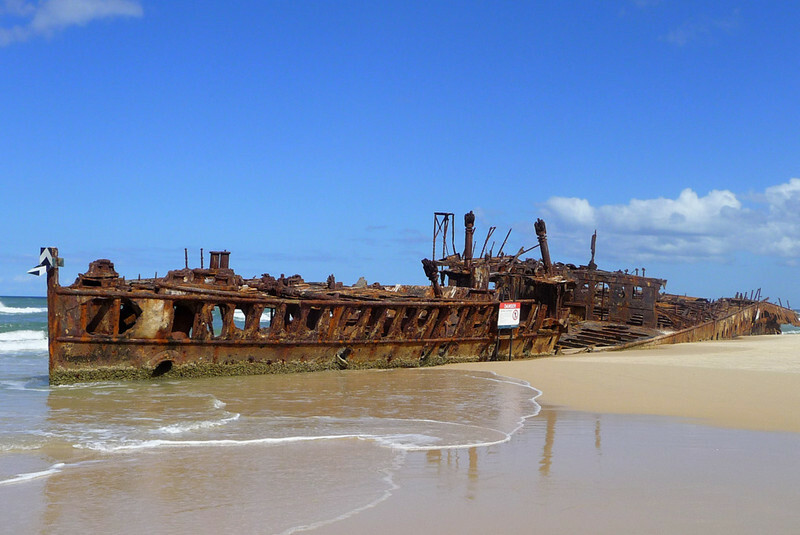 Fraser Island is home to 79 species of reptiles, including 19 kinds of snake. 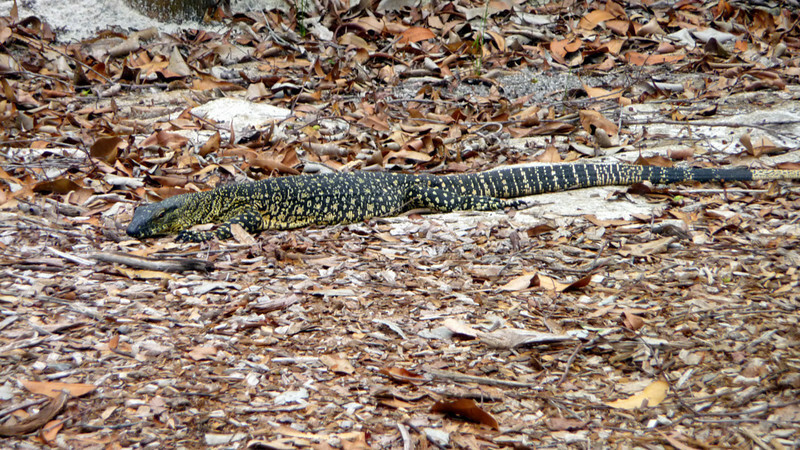 Here's quite a common one - called a Sand goanna (or the Sand monitor). It was nearby our lunchtime venue. This is the second one that I encountered close up. I've since read that these reach an average length of 140 cm (4.6 ft) and can weigh as much as 6 kg (13 lbs). 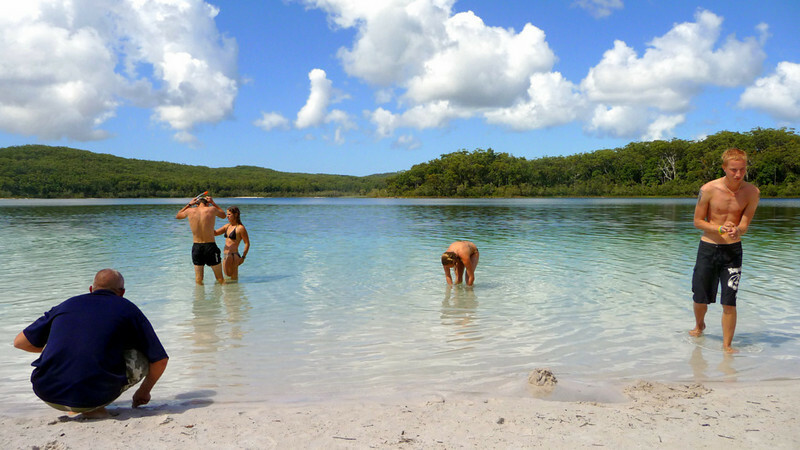 Final activity of the day, a freshwater swim at Lake McKenzie. 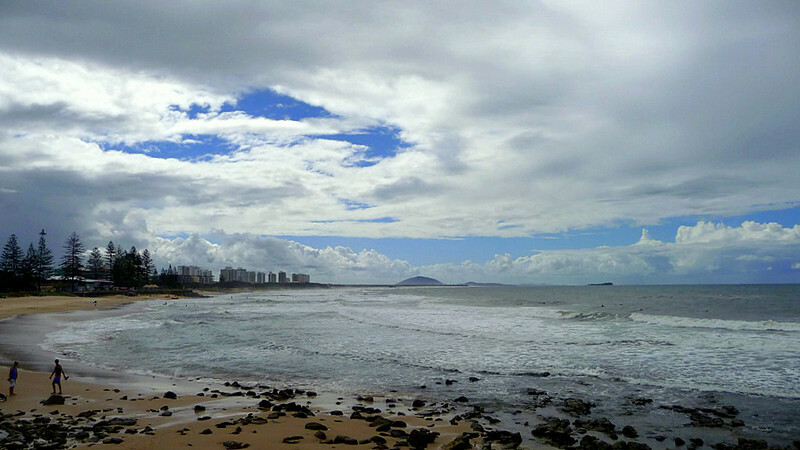 The shoreline here is considered by some to rank amongst the world's top ten beaches. The McKenzie sand has distinct cleansing properties .. and we are encouraged to massage handfulls of the stuff into our 'partners' skin. Well, young Rachel (in her late 20s) and I were the only two on the tour sans 'partner'. I must now admit it - I've turned into a dirty ol' perve. Thanks for being such a great sport Rachel. You're quite a gal! Have a safe trip back to Nottinghamshire, England (via Africa). 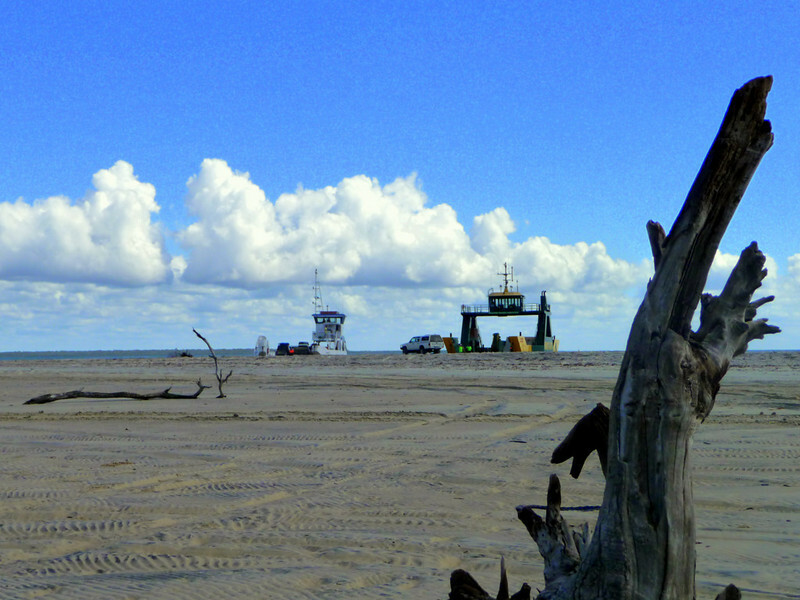 A hairy ride towards the end of the 4x4 journey - back to the barge .. and the mainland. 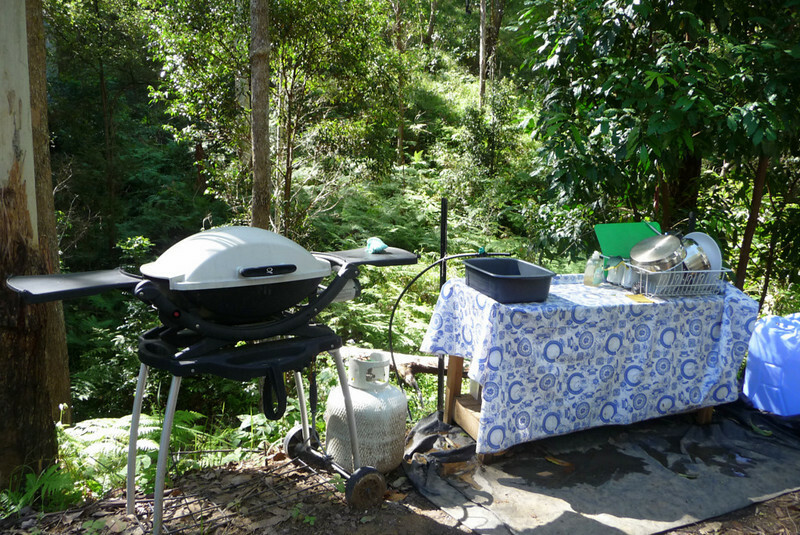 We're all going back with a fresh batch of mozzie bites to scratch and sooth ..
With now nearly 6,000 km [3,730 mi] completed, I figured that I was not far off the halfway point of this second leg around Oz - and as I had some spare time on my hands ..
.. I carry out a engine oil and filter change. That's a good feature of dual-sport motorcycles like Transalps; because they sit so high off the ground, when it comes to lube changes, you can slide an ordinary domestic plastic bucket under the crankcase .. with room to spare, which makes the whole job quite simple .. wherever you are. Even here at Debbie's Place - probably one of the finest Guest Houses I stayed at throughout my entire time down under. Thanks for all your help and support Debbie (and for magically dealing with my laundry) .. you're just too kind for words.